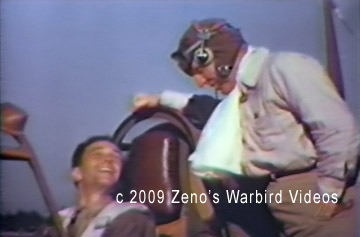 Watch the World War II training film used to familiarize new pilots with the Curtis P-40 "War Hawk" fighter "live" over the Internet. The Flying Tigers deadly weapon in China, the P-40 was the Army Air Corp's front line fighter at the outbreak of the War, and this rugged plane served the Allies around the world. The Warhawk's heavy fire power, fast dive, and ability to double as a fighter bomber served the AVG well. plus P-40 performance charts, cockpit photos, systems diagrams and more P-40 video! These are excerpts from an original Curtiss P-40 Warhawk pilot's manual. 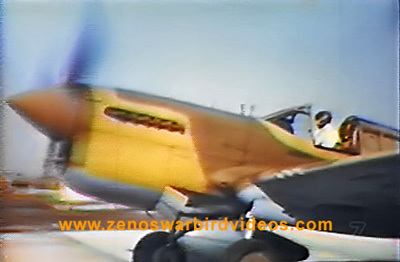 * How to Fly the Curtiss P-40 "War Hawk" NEW "Color corrected" footage. You can see the difference A Flight Shop exclusive! After Pearl Harbor, the American Volunteer Force (AVG) Flying Tigers and their P-40s were incorporated into the new 14th Air Force, and their CO, Claire Chennault, was put in command. This is story of the 14th in action, including P-40 gun camera footage, the epic airlift over "The Hump, and a rare look at air operations in China. * Why We Fight: The Battle of China This is the sixth installment of Academy Award winner Frank Capra's legendary "Why We Fight" series and it is devoted to the conflict between China and Japan from the early 1930's through America's entry into the conflict after Pearl Harbor. As such, it is an excellent background piece on the war that the Flying Tiger's fought in China as "The American Volunteer Force." As might be expected, the film does not stint on wartime propaganda, but it is also a unique repository of film from this seldom covered theater, including captured footage of the Imperial Japanese Army and Air Force in action. * 32 page P-40 Warhawk pilot's manual in .pdf file format with photos, detailed systems diagrams, performance charts, procedures & more.